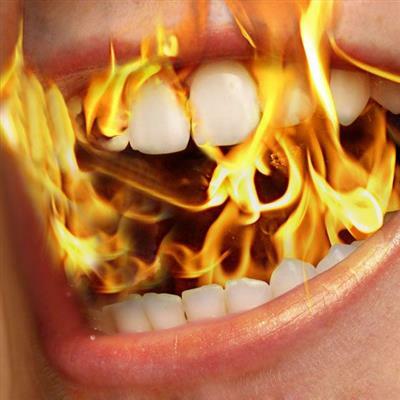 Burning mouth syndrome is a name given to discomfort or pain in the mouth. It often affects the tongue, lips and cheeks but other parts of the skin lining inside the mouth can also feel uncomfortable. Most people with the condition complain of a burning or scalded feeling. Burning mouth syndrome is a common condition. It often affects women, particularly after the menopause, but men can sometimes get it too. Up to one in three older women report noticing a burning sensation in their mouth. The sensation of burning in the mouth can occasionally be the result of medical or dental problems. These include thrush infections and blood or vitamin deficiencies. The hormonal changes around the menopause can be related to burning mouth syndrome. It can also occur or get worse when somebody is stressed, anxious or depressed, or going through a difficult time of life. Not knowing why your mouth is burning can also make you anxious. If you describe a burning sensation in your mouth you will be examined thoroughly to make sure another medical or dental cause is not responsible. Some blood tests may be arranged for you to look for such a possible cause. Sometimes people get worried that they may have mouth cancer. This is quite a common anxiety of people with burning mouth syndrome. Carrying out a thorough examination and any necessary tests will enable your doctor to reassure you that all is normal with no signs of cancer. Hormone replacement therapy hasn’t been shown to improve the symptoms, and neither have vitamins if your blood tests are normal. Symptoms often improve following reassurance that there is no serious disease present in the mouth. The burning feelings can sometimes be worse at times of stress and go away when life is running more smoothly. We know that we can’t always make you better. Trying not to focus on the feeling, learning to live with the sensation, and remembering that no serious disease has been found can sometimes be the best way of managing this common problem.